I spy with my little eye... our Vintage Market. 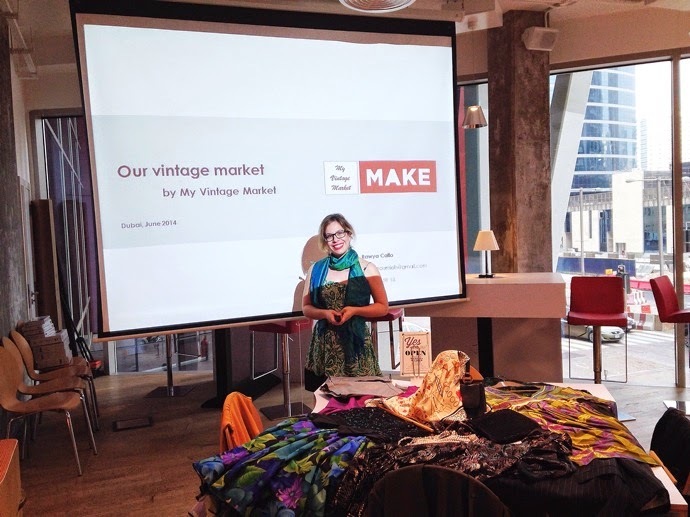 Back in Dubai, where vintage aficionados gathered yesterday at Make Business Hub for a Conversation on Vintage. Led by Rawya Catto, the event was meant to open the discussion about vintage, retro, the trends, the leading cities and assess where Dubai stands in that global context. We all know that Dubai is really not the capital of retro but it is an international hub, therefore like, everywhere, the interest is present to a certain extend, and this is why she invited me and my pincurls: to represent! The idea was to gather people with a common interest in all things retro, so Merci to the ones who came and shared their stories. That's one of my favourite things about vintage: I love the aesthetics, I love the fact that it's eco-friendly, sustainable, most of the time affordable, but most of all, it's full of stories. Every hat, piece of jewellery, book, piece of china, dress, even fabric sometimes, carries the memory of a grandmother, a grand uncle, or that moment when you found it under a big pile of junk, like a hidden treasure. I spy with my little eye... Pink Lemonade! 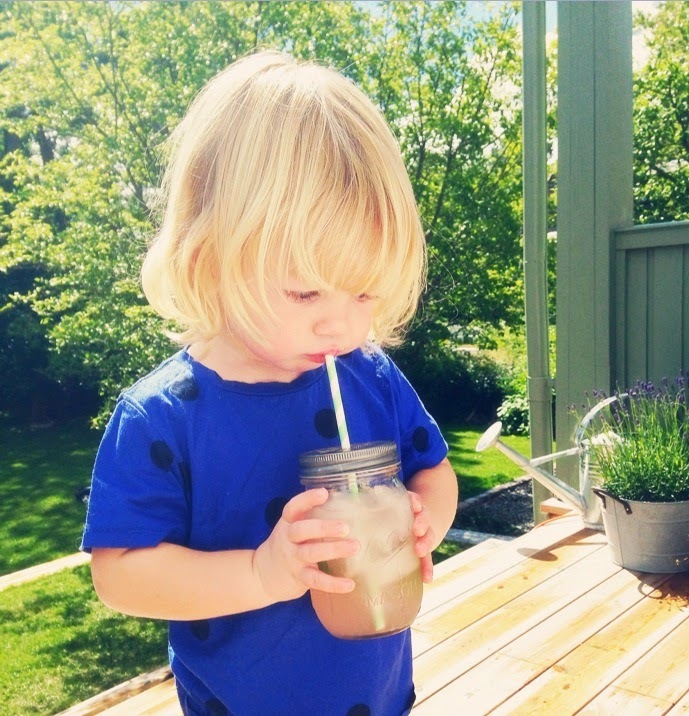 For Midsummer, Hanna decided to make lemonade. 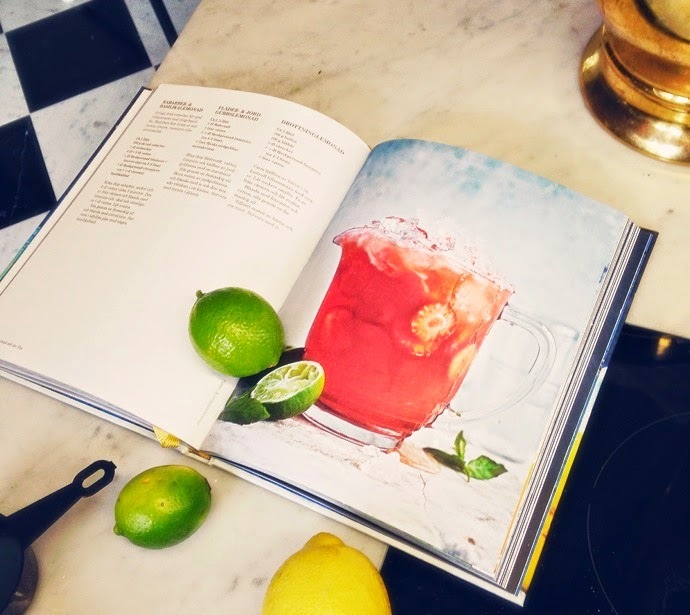 She chose a recipe with a twist: rhubarb and basil lemonade, such a beautiful pink colour! We started with lemons and lime obviously. 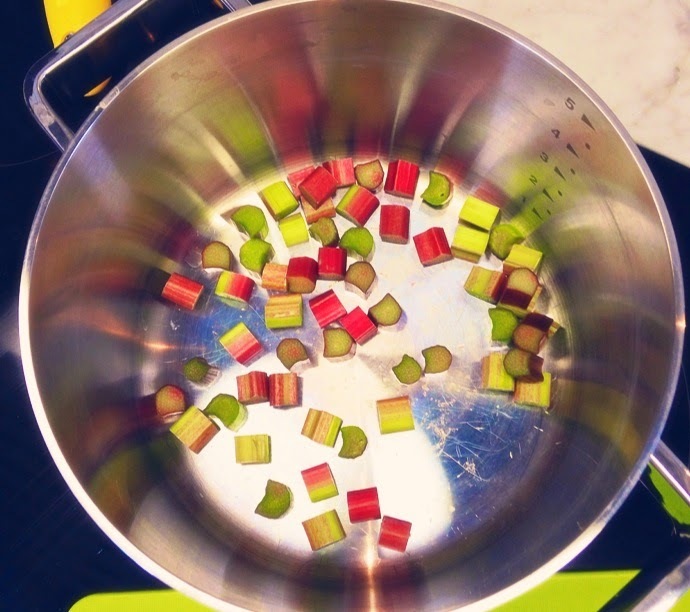 Followed by rhubarb that we boiled with a little bit of sugar. Next step was to mix the 2, filter it and leave it to cool down. We ended with a vibrant pink liquid, since it was a bit too strong, Hanna added sparkling water, ice, and the basil at the last minute. I. and I both agreed: it was very tasty and incredibly refreshing, I will definitively remember this recipe. Dubai, be ready for rhubarb and basil lemonade! 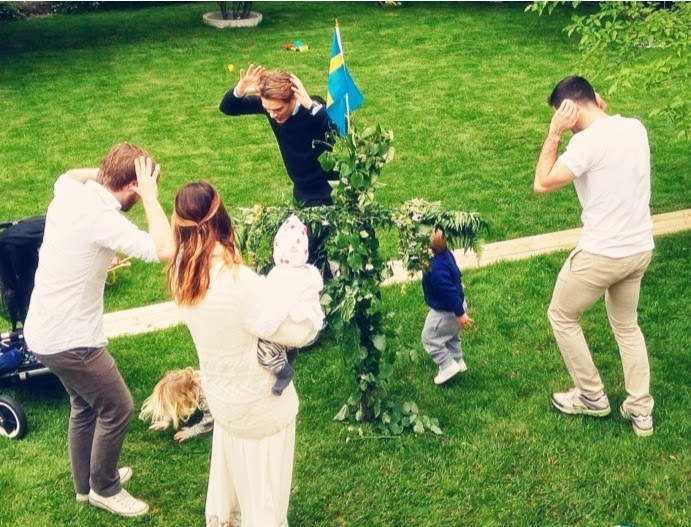 I spy with my little eye... Swedish summer celebrations. My last post was focused on flowers but Midsummer is mostly about friends and family. As I said earlier, I felt like it was a Christmas in summer: the anticipation, the cooking, the gathering, singing, dancing... and then doing it all over again reminded me of winter holidays. 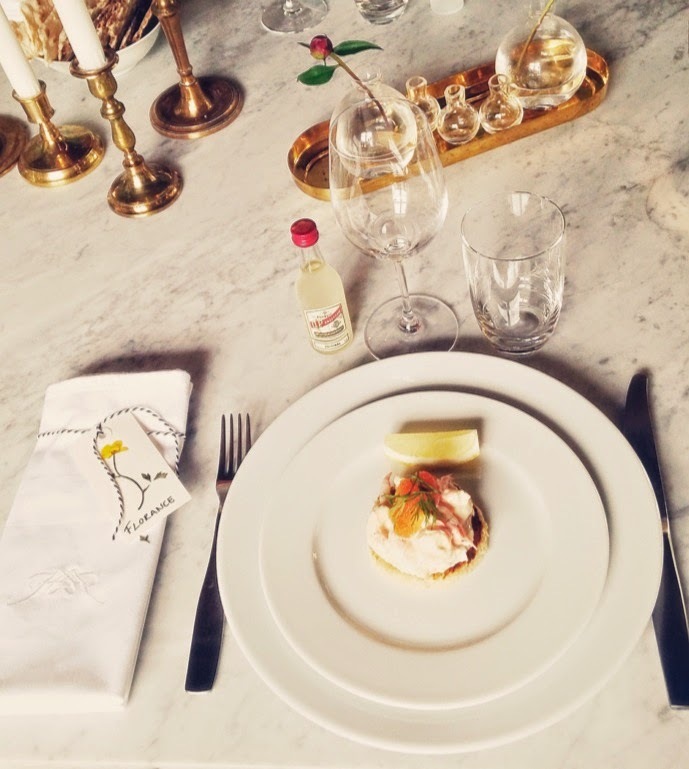 After we got the flower crowns down, we started cooking: Toast Skagen (understand shrimps toasts), herring and potatoes, classic swedish strawberry cake, Maraengsvis, all of that washed with schnaps and wine. I love hanging out in the kitchen. I guess my mother got us used to it since she was always in there and always told us she enjoyed the company, hence we ended up chatting afternoons away with her while she was cooking or sewing. 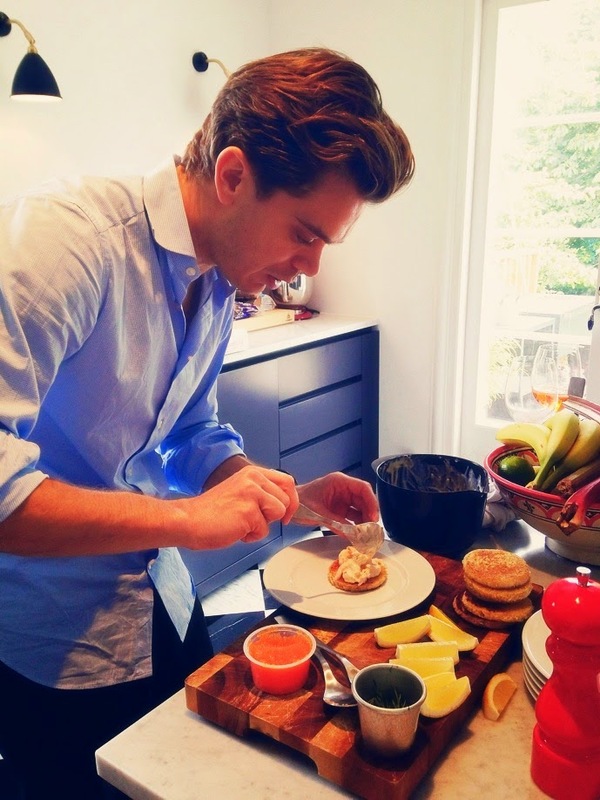 It's a very cosy and family oriented room for me, and it's even better when men are cooking. 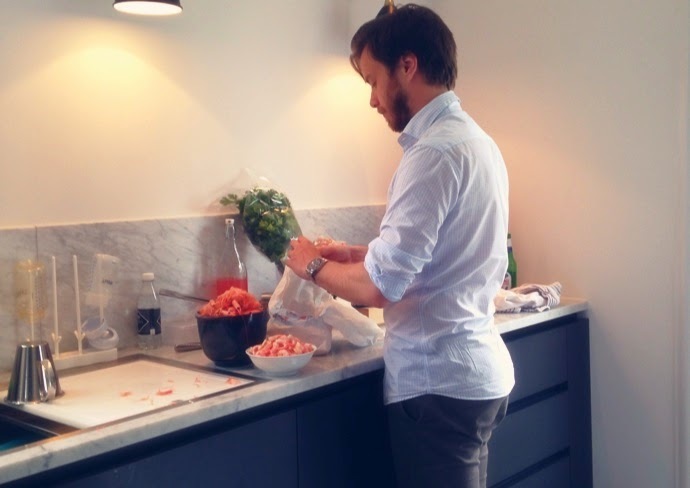 From my experience, french men aren't really drowned towards the kitchen so I always salute countries that have a better partition of domestic life and Sweden is definitively one of them. Thank you A. and J. for patiently cleaning all those shrimps and furthermore for singing while doing it! Hanna had set a beautiful table with handmade name tags. I always say that details are not just details, so the fact that she had thought about it, picked flowers, taken time to dry them and then to make the name tags touched all of us. It was a gorgeous table, thank you! 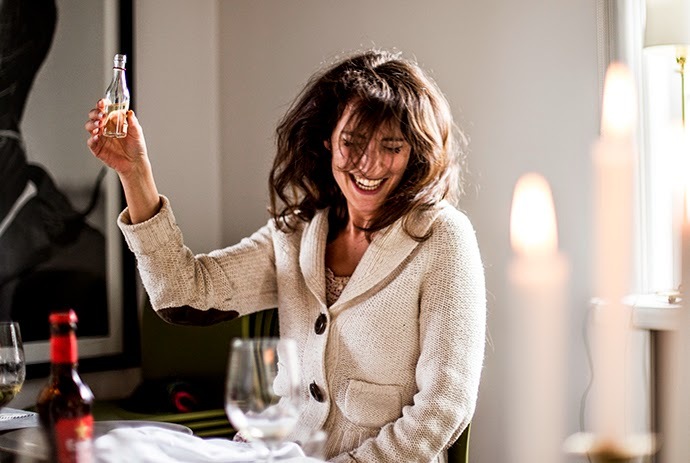 And as you can see, Schnaps was part of the celebrations. I'm pretty sure it was the first time I had some (and if it wasn't, I had probably enjoyed too much of it...). It is definitively a strong liquor, pretty much tastes like vodka to me, which means: accessible, easy to drink and effective. The tradition is to sip it through the diner after singing a song: whoever around the table is inspired will start singing, everybody will follow the lead and have a sip at the end of the song. 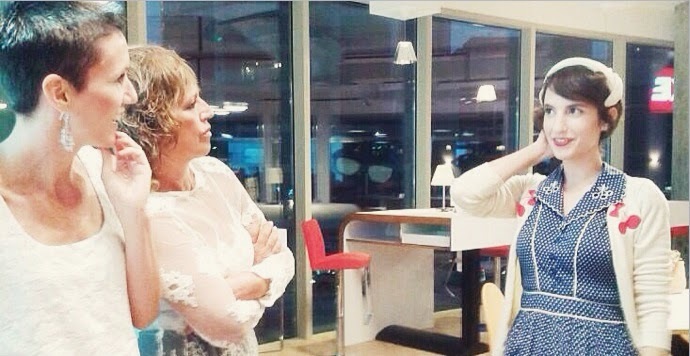 So this is what happened half way through lunch: me, singing the Marseillaise... pretty effective as I was saying. 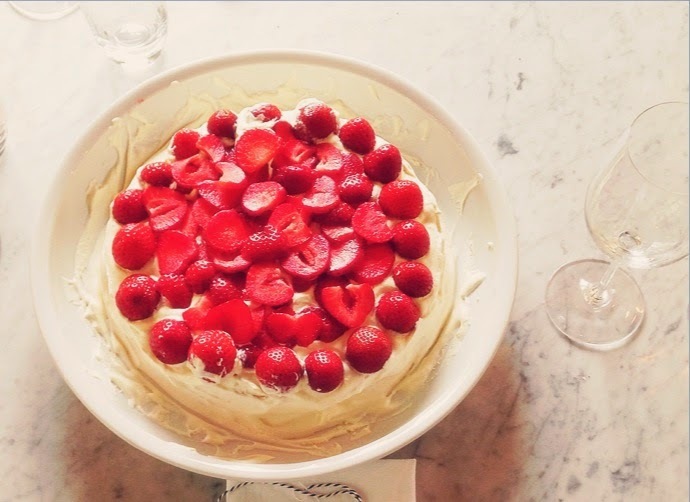 Strawberry cake was the perfect way to finish a joyful lunch! And so out we all went to dance around the Maypole and play Kubb. 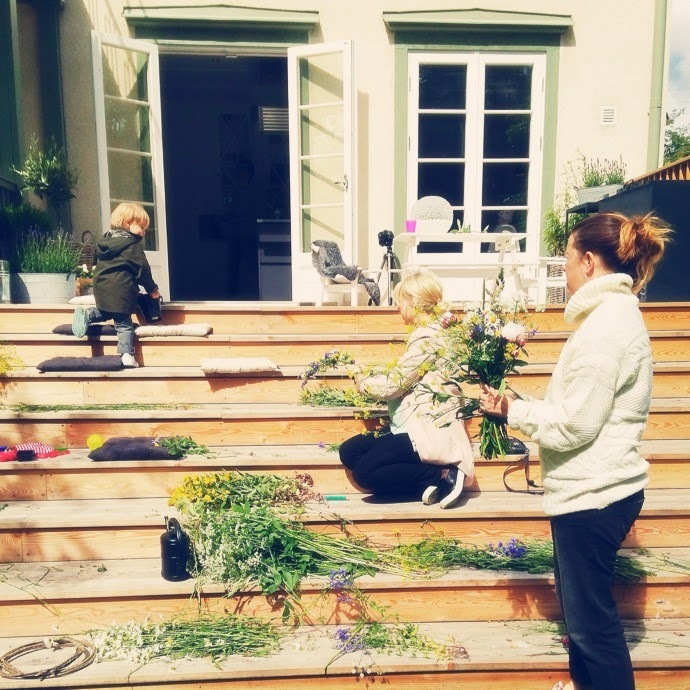 Midsummer is like Christmas in the way that it's a total different experience with children. 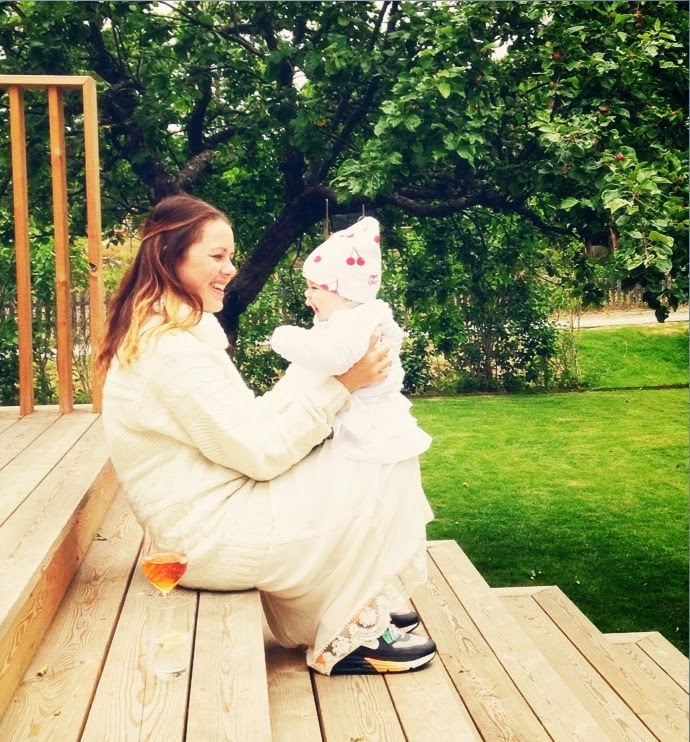 It was little R.'s first Midsummer, just like me and as you can see, she enjoyed it a lot. Lots of smiles and happy shouts, that little one is a party girl! And because it is the tradition at Midsummer: once you have drank, eaten and danced around the pole, you do it all over again in the evening. I LOVE swedish traditions! 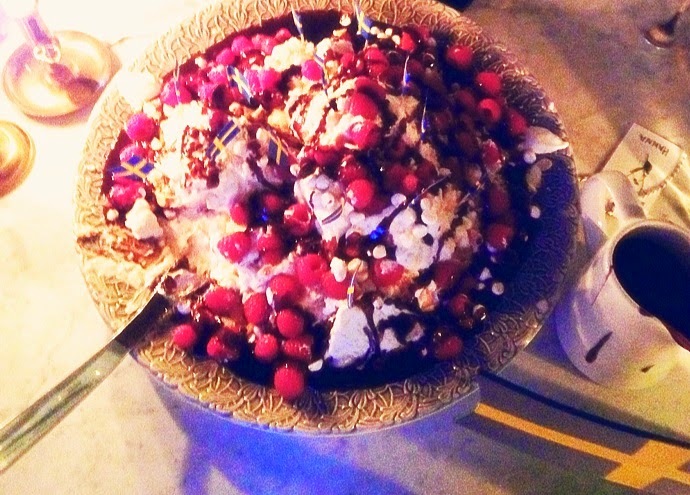 This is how Maraengsvis happened around 10pm: vanilla ice cream, raspberries, cream, meringues and chocolate sauce... the swedish equivalent of the Eton Mess, also known as Death By Desert. I want to thank again Hanna and HP for hosting such an amazing celebration and allowing me to get to know and be a part of that Swedish celebration. Merci to the Gentleman who didn't give up on me despite my thousand questions, and a big up to all the fun people I met! Looking forward to introducing ya'all to Bastille day! I spy with my little eye... Midsummer in Sweden! Those following me on Twitter know that I flew to Stockholm 2 days ago to celebrate Midsummer. It is a first for me so I was very curious and eager to discover the traditions. Lisa had already gave me a hint of the celebrations and the Gentleman had tried to explain the concept behind the flower crowns but I couldn't wait to experience it, so a big big Merci to Hanna and HP for hosting us and organising such a fantastic day! For those who are not familiar with the concept, the Swedes celebrate the summer solstice which is the longest day of the year (the sun sets for only 2 or 3 hours tops in Sweden) by partying all day and night. It felt like a summer Christmas to me: everybody gathering around 11am, helping with the cooking and the setting of festivities, children running around, good wine, home made food and lots of friends and family. 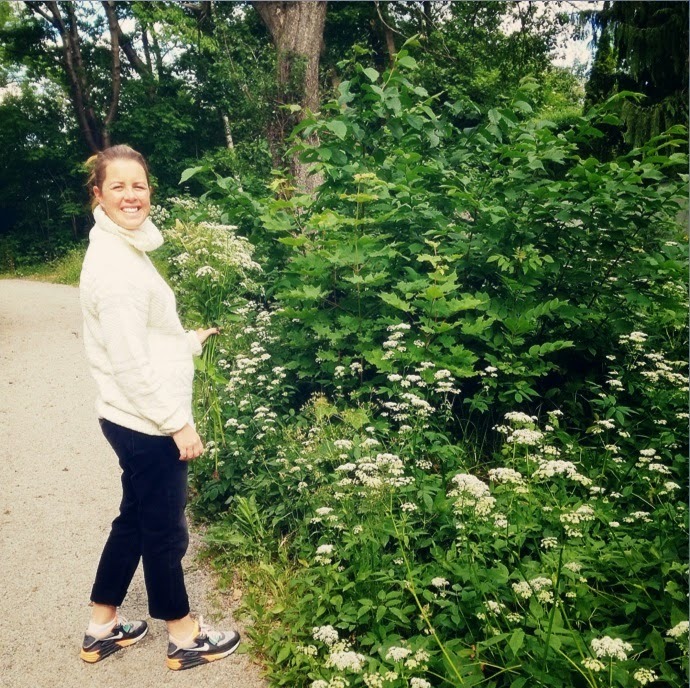 So Hanna and I started the day by going on a walk picking flowers. The tradition is that single girls should go through 7 different fields, over 7 fences to pick 7 different kind of flowers. 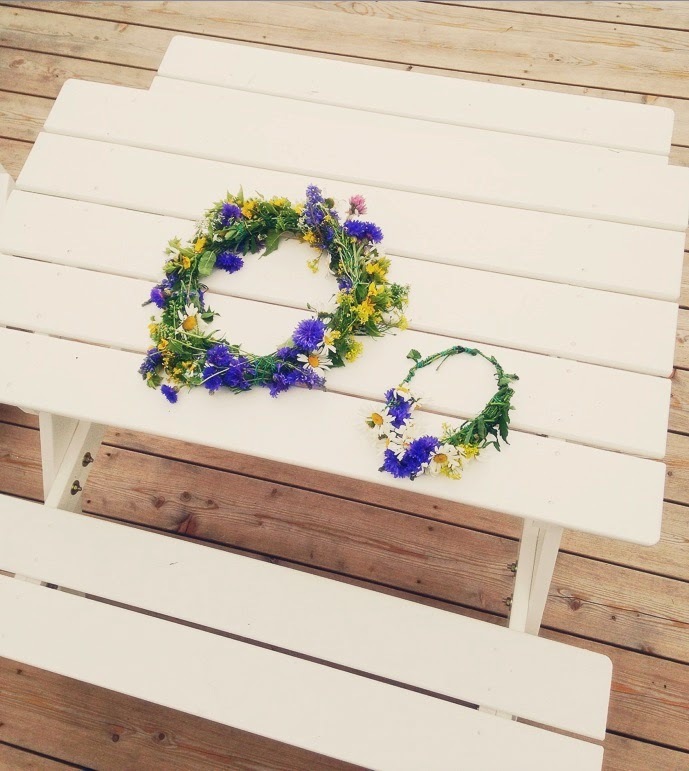 Then they would make flower crowns on Midsummer and that was supposed to allow them to dream about the man they were going to marry. I can't say I dreamt about a wedding but I did love that early walk in the neighbourhood with birds and frogs. 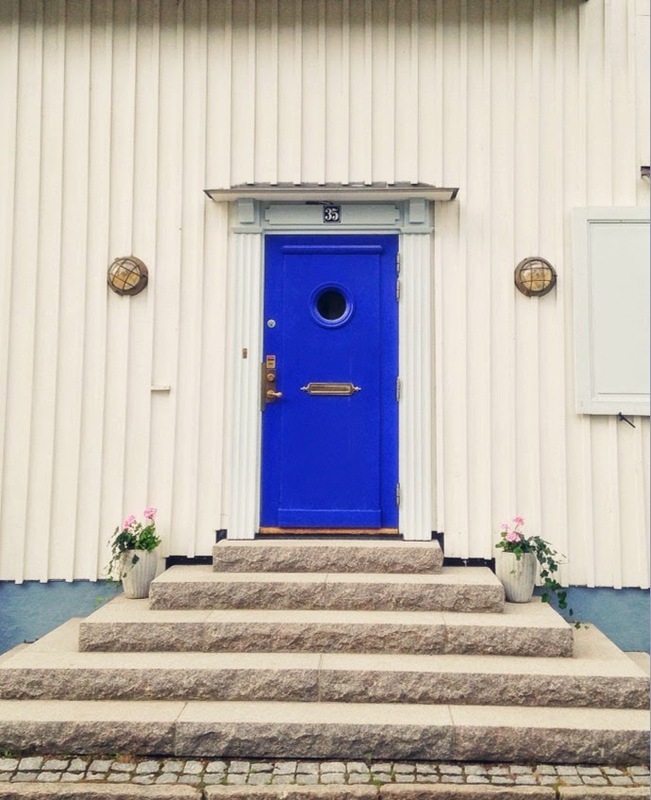 The house is in the suburbs of Stockholm, around a lake, the houses are colourful and pretty cosy, and the weather was dry, sunny and chilled, great to wake up. Next step after picking the flowers was filtering them in order to make the crowns and dressing the Maypole, a wooden pole (actually it looks more like a cross with 2 flowers crowns hanging on each side). I am not going to get into the meaning of the Maypole, between paganism and manhood, I am still trying to figure it out, but the tradition is actually to dance and sing around it, and obviously: I could not wait to witness that! Pictures to follow, bear with me. 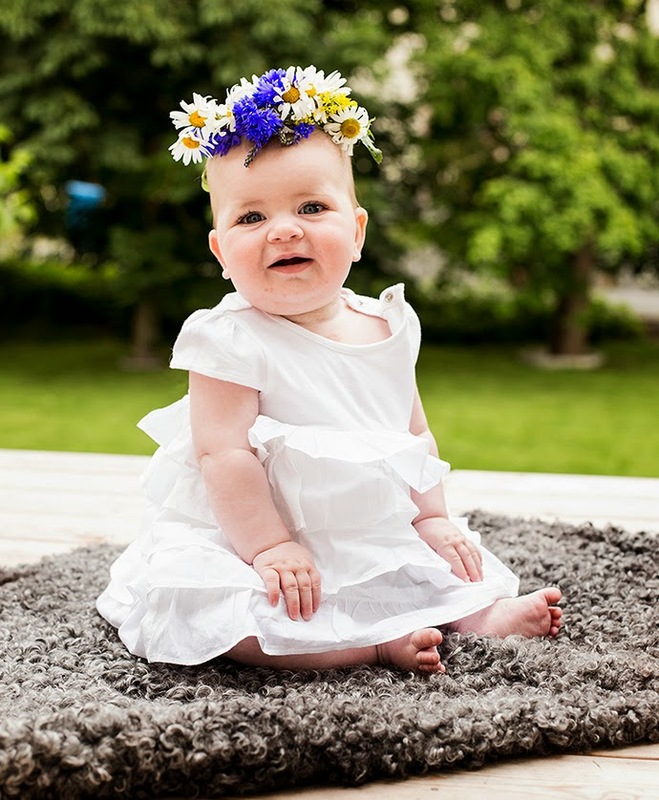 Making the crowns is a skills that Swedish girls learn quite early on. 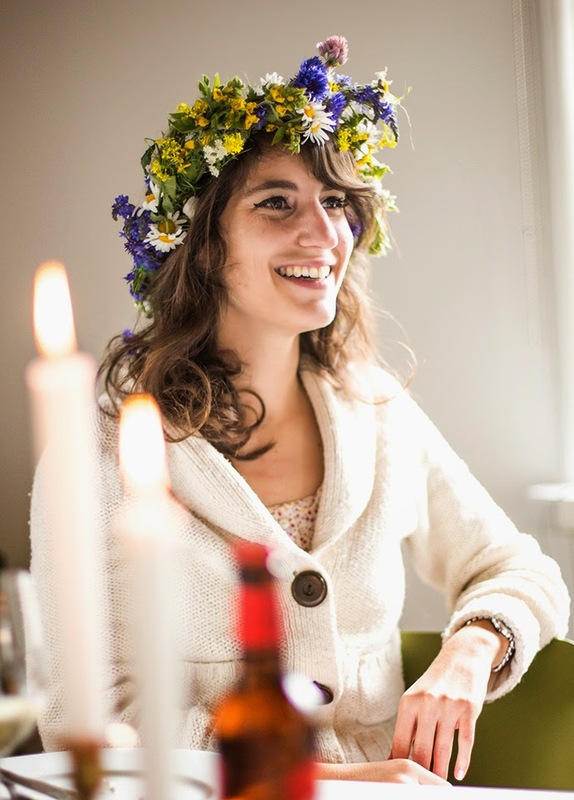 C. who made ours was telling me that they spent their teenage Midsummers making flower crowns. 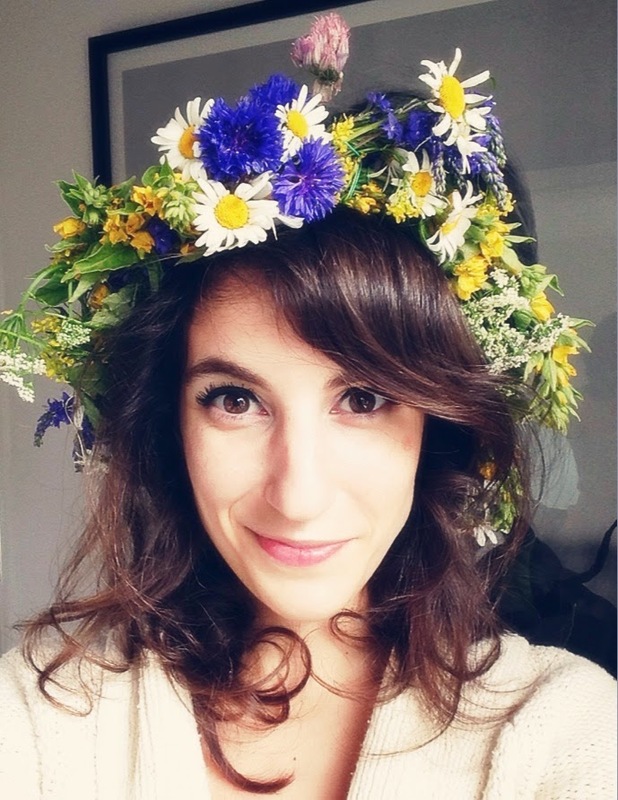 She hadn't done it in a few years but it seems like making flower crowns is like riding a bike: you can't really forget it! And so the day was filled with flowers and good food! 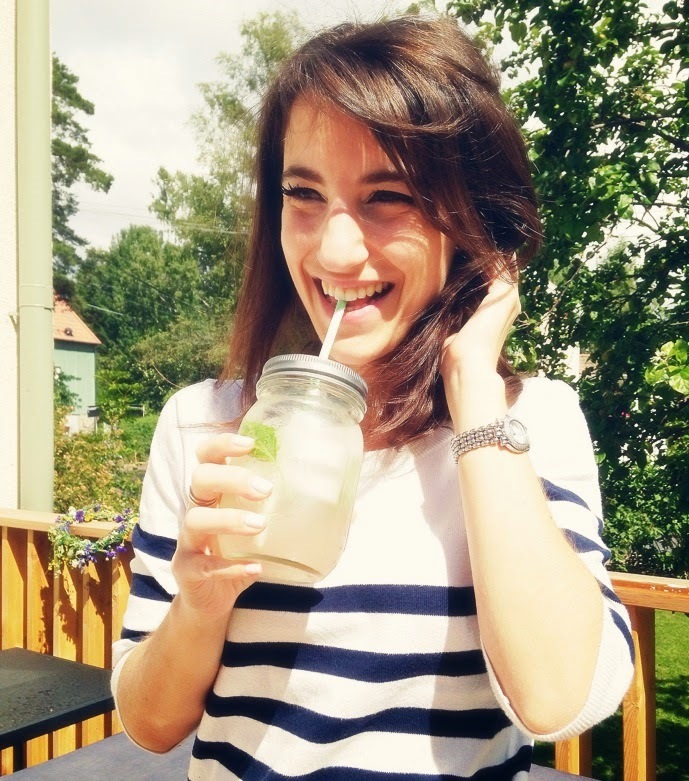 Here is to Sweden and Summer, Glad Midsommar pitchouns! I spy with my little eye... time passing by. I am slowly but surely reaching my 3rd year in Dubai so I feel it is time to look back at those three years and see what I have learnt. Everybody says Dubai is like Uni: people come and go, everybody is young and dynamic, the city has a life and energy of it's own and if you want, you can be out every evening. I do agree with that, it feels like I went from one city of light (Paris) to an other. But I never really had the Uni experience back in France and I was partially raised up abroad so I guess it wasn't all new to me. I was lucky enough to meet amazing people, friends that I call my Dubai family, these are the guys I can call if I'm in trouble and I am grateful to have them in my life. But as much as I enjoy Dubai's social life, going from one party to an other isn't really for me. Lots of parisian friends are pretty wary about Dubai, they find it too shiny, which I get. 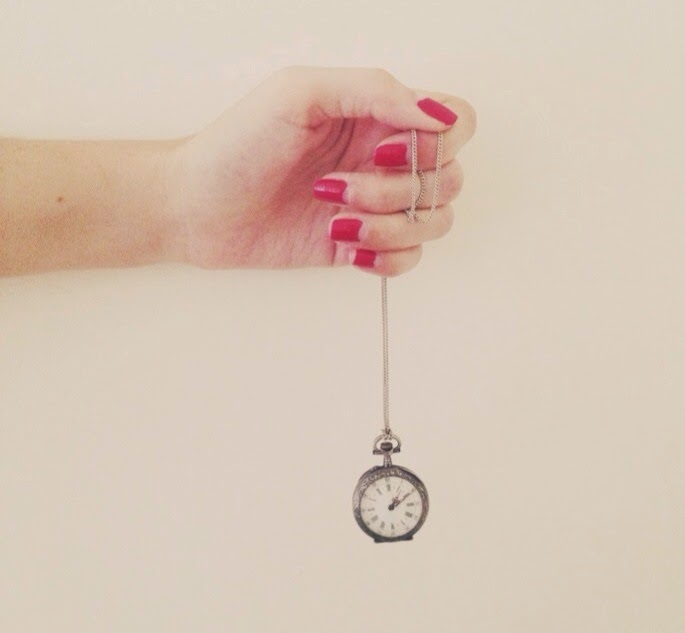 So I thought after three years in the sandpit it was time to share my experience. I am curious so my first year in the UAE was mostly spent trying everything I could: parties, galas, art opening, BBQs, brunches, it was a social whirlwind (except during Ramadan, I think even non Muslims are grateful for that quiet time that allows them to calm down). Now the second year I had settled in, I knew my way around town (well, as much as someone with a poor sense of orientation can know her way), I had found good spots, good people, so I felt confident enough to quit my job, that was a big step but it probably saved some of my friendships. The third year, I felt like cocooning. 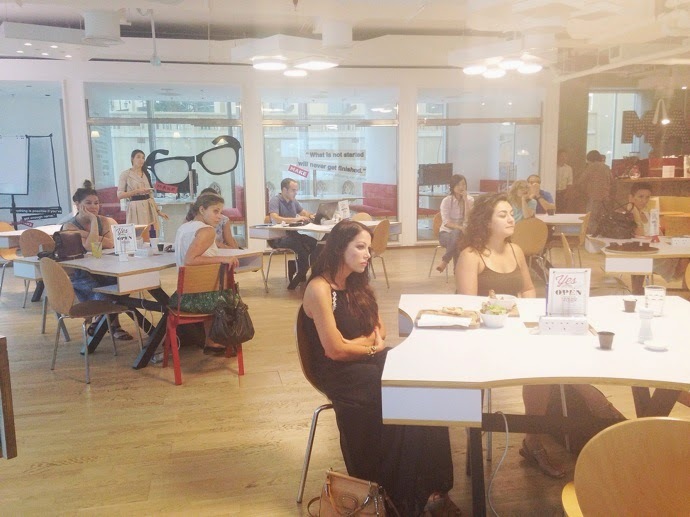 I disappeared from the social scene and focused on art, HOB and friends. I think the third year felt like a real year. No more whirlwind. Social life yes, but curated, and that is a nice balance. I do love Dubai, it's energy, it's sunshine, it's enthusiasm, it's professional opportunities (yes I eventually went back to corporate life, Oh Joy! ), I miss good ol'Europ and it's kilos of vintage stuff, but I wouldn't trade my sunny life for the world. I think people who haven't experienced full on sunshine 24/7 don't realise how energising it is. So cheer up Paris, you haven't lost me to shiny loud Dubai, I just need a little bit more sunshine than you can offer.